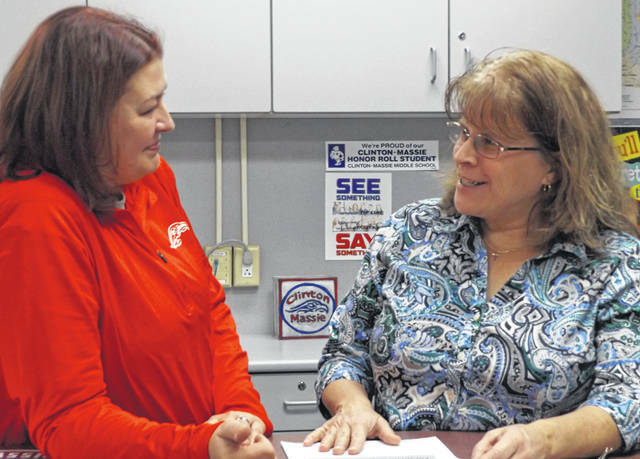 Newly appointed Clinton-Massie school board member Kathleen Norman, right, converses Monday with Clinton-Massie Treasurer Carrie C. H. Bir, left, who’s in her first month on the job. ADAMS TOWNSHIP — Kathleen L. Norman was selected Monday to fill an open Clinton-Massie school board seat, with the board president citing Norman’s communications background as a key to his support. Seven people were interested in the spot formerly occupied by Christopher “Chris” Harrison who resigned effective New Year’s Day. The remaining board members appointed Norman in a 3-0 vote, with one member absent. Norman said she hopes “to step right in and contribute as much as I can.” She has frequently attended Clinton-Massie Local Schools Board of Education meetings the past five years, and said she feels like she is somewhat up-to-speed on some of the matters the board faces. Norman holds a bachelor’s degree in public relations, and she said most of her corporate business career has been in communications-related roles. She worked for Xerox from 1995 to 2012, and currently works with Exela Technologies, Inc. as senior proposal writer and manager. Of her board appointment and communications experience Norman said, “To me, I want to make sure the message is getting out to as many people as possible. The school really feels like it’s part of the community but sometimes we have trouble getting information out to the community. So I’m hoping I can help with that,” said Norman. The term Norman is completing will expire at the end of 2019. She anticipates she will probably run as a candidate this fall in hopes of remaining a board member. Her family moved to the area in 2001, and she said she didn’t become engaged with the school district until 2008 when her daughter Jenna started kindergarten. Jenna is a sophomore now and son Daniel is a fifth-grader. Norman’s involvement with the schools has included serving as Clinton-Massie Vocal Fund treasurer, Clinton-Massie Educational Foundation Board member and volunteer, CMHS Parents Advisory Board, Clinton-Massie advisor for the Leadership Clinton Youth Collaborative, and PTO communications chairperson. Volunteer commitments have included programming chairperson for Leadership Clinton Adult and Youth Programs, Sinclair Community College TechFest advocate for Clinton County, communications consultant for Clinton County Service Unit of Girl Scouts of Western Ohio, and the Friends of the Clinton-Massie branch of Wilmington Public Library. Norman is a 2014 graduate of Clinton County Leadership Institute, commonly called Leadership Clinton. The other six people considered for the open school board seat are Chad Beam, Jamie Dean, Dustin Eads, Mike Gorman, Matt Lamb and Doug Lewis.